The diversity of life that can be seen in environments ranging from the rainforests of the Amazon to the spring blooms of the Mohave Desert is awe-inspiring. But this diversity would not be possible if the ancestors of modern plants had just stayed in the water with their green algal cousins. Moving onto dry land required major lifestyle changes to adapt to this new "hostile" environment, and in turn helped change global climate and atmospheric conditions to conditions we recognize today. By absorbing carbon while making food, and releasing oxygen, early plants shaped ecosystems into a more hospitable environment, paving the way for animals to make a parallel journey onto land. New research by Dr. Linda Graham and colleagues at the University of Wisconsin, Madison focuses on this transition and adaptive changes in the uptake of carbon-based compounds, such as sugars. This work, which is published in the September issue of the American Journal of Botany, suggests a basis for incorporating evolutionary/paleontological information into global carbon cycling models. 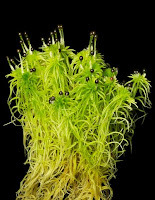 All plants descended from a group of ancestral green algae, whose modern representatives thrive in aqueous environments. The simplest of modern land plants—several groups of bryophytes—are the closest living relatives to the first plants to colonize land. By comparing green algae and bryophytes, Graham and her co-researchers obtained insight into the evolutionary hurdles that plants needed to overcome to transition successfully to life on land, and how early plants' success influenced carbon cycling. The researchers quantified and compared growth responses to exogenously (externally) supplied sugars in two green algae, Cylindrocystis brebissoni and Mougeotia sp., and one peat moss species, Sphagnum compactum. They found that sugar/carbon uptake in peat moss was not restricted to the products of photosynthesis. Rather, addition of sugars to the growth media increased biomass by almost 40-fold. This ability to utilize sugars not only from photosynthesis but also from the environment is called mixotrophy, not previously thought to play a significant role in the growth of mosses. The two green algae also responded to external sugar, though less so than the peat moss. Peat mosses "store a large percentage of global soil carbon, thereby helping to stabilize Earth's atmospheric chemistry and climate," stated Graham. This has far-ranging implications to global carbon cycling because previous work examining the response of mosses to carbon availability assumed that carbon dioxide was the only carbon source available to peat mosses and ancestral plants. The new results indicate that efforts to model global atmospheric and climate changes, both in the present and millions of years ago during the colonization of land, should take mixotrophic behavior of early diverging plants into account. Graham and her co-researchers have enjoyed a cross-hemispheric partnership, from Wisconsin north to Canada and south to Chile, and look forward to comparing the biology of Northern and Southern hemisphere peat mosses. In particular, they would like to "explore in more depth the role of sugars in the establishment of ecologically important microbial symbioses, particularly nitrogen-fixing cyanobacteria living with peat mosses," explained Graham.